Last Friday, August 25th, the Lt. 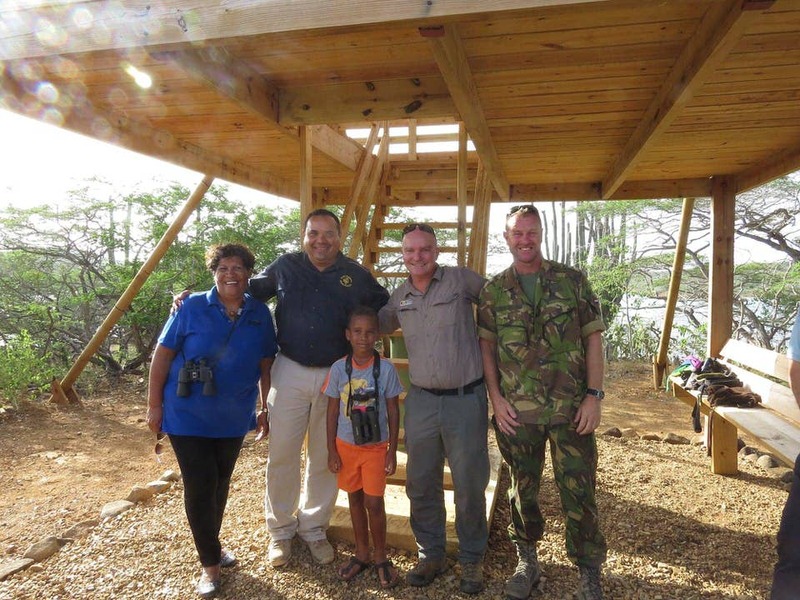 Governor of Bonaire Mr. Rijna inaugurated the brand-new bird watchtower at Slagbaai. The construction material for the tower was sponsored by Cargill. The watchtower design was based on the Donkey Sanctuary watchtower and built by the Dutch Army with the help of Washington Slagbaai National Park rangers. The watchtower, situated at the Saliña Slagbaai in the Washington Slagbaai National Park, will provide excellent birdwatching opportunities. Some information signs with bird photos were placed so people can easily recognize the different birds. By creating a watchtower together with the different STINAPA birdwatching excursions, STINAPA contributes to the development of birdwatching tourism. Birdwatching and bird photography in the USA and Europe is the fastest growing hobby. During the migration season, you can find 90 different species of birds in a week and we should not forget about our Flamingo’s, Lora’s, and Prikichi’s. During the past 2 years, tourists are starting to get more interested in birdwatching on Bonaire. The creation of a watchtower is a perfect fit in this development. STINAPA is very grateful to the Dutch Army for the help with the construction of the watchtower and Cargill for sponsoring the construction material.